Rolando Aarons has taken to Twitter to issue an emotional statement after his season was ended by injury. 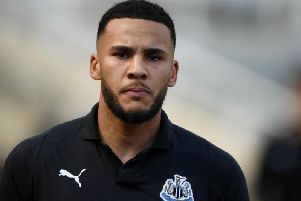 The luckless Newcastle United winger ruptured the anterior cruciate ligament in his right knee this week. But Aarons – who has been hit by a series of injuries since breaking into the first-team squad two years ago – is already focused on his rehabilitation. And the 21-year-old hopes the Championship leaders will be back in the Premier League next time he takes to the field. Aarons said: "Since making my debut, I’ve been unfortunate with injuries, my most recent injury being the worst. “I’ve had to pick myself up and go again every time, and this time will be no different. “Injuries like this are not only hard to cope with physically, but emotionally too. “Life comes with challenges, and knowing myself I’ll come out of this a stronger person and footballer. “I’d like to thank everyone for the support and well wishes, especially the fans who are frustrated at not being able to see me play much these last few years. “I have worked my whole life to be able to live my dream as a professional footballer, and I’ve come too far to quit. “God willing, next time I step onto St James's Park to represent this special club we will back where we belong!"